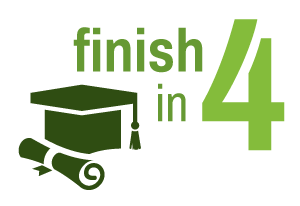 Why is it important to "Finish in 4", or two for transfer students? Besides the time and money it takes to extend your time to degree, prospective employers and professional/graduate programs look for applicants who have demonstrated the ability to succeed while taking a full course load each quarter, being involved on campus, and possibly holding a part time job. You want your record, when you graduate UC San Diego, to reflect your ability to work hard, manage your time, and balance other responsibilities and interests. Bottleneck courses (courses required for our majors that are oversubscribed) will be offered more often. Instructors are encourage to eliminate or modify prerequisites that are not essential for success in their upper division courses. Biology has reduced the number of required units for graduation in most biology majors, and regularly review possibilities for further reduction without compromising the quality of our programs. We are working to accelerate transfer student progress via participation in new summer programs such as Summer Academy and START, including transfer student advising sessions in August. There are many benefits to finishing your bachelor's degree in four years. Fees, books, materials and living expenses add up. If you have to take an extra quarter (or more) of courses, it will cost even more. If you are an out-of-state student, additional costs will be even higher. If you enroll in more units per quarter, you are getting more value for your money. Starting the first day of classes, UC San Diego undergraduate students can enroll in 22 units. No additional cost is charged for any units you enroll in at full time status (there may be some specific lab or other fees, depending on the specific courses in which you enroll). So, fees to enroll in 16, 18, 20+ units is the same as the amount UC San Diego charges for 12 units. If you are planning to enter the job market after earning your degree in Biological Sciences, staying in college for an additional quarter or more costs you money in lost salary. Delaying the start of employment by a quarter or more lowers the speed with which you begin earning an income, and it may reduce your overall lifetime income as well. Prospective employers and graduate/professional school admissions committees are looking for people with a strong work ethic, who are willing to put in long hours to achieve their goals, and who are able to succeed under pressure. Having a UC San Diego record that demonstrates you were able to successfully complete a 16+ unit workload each quarter, while being involved in student organizations and/or research, will show prospective employers and admissions committees that you are committed to succeed. There are several steps to follow to get on track, and stay on track! Ensure you graduate from UC San Diego in four years, or two for transfers. Choose a major that is right for you. Consult with your college advisors, major advisors and career services if you have questions. Now is the time to ask! They are experts at helping students identify skills, strengths and interests and to match those to majors offered at UC San Diego. The sooner you identify the right major for you, the sooner you will finish in 4. Go to class, keep up with all assignments and seek help whenever you have a question. Meet your instructors and Instructional Assistants early in the quarter. Make a point of attending office hours, discussion sections and any other opportunity you have to get assistance. Your professors want you to succeed, so go talk to them! Resources to improve academic achievement are available. Meet with you major advisors every quarter to make sure your on track. More importantly, take their advice. Your advisors will not select courses for you, but they will help you to review your major requirements, plan out what courses you could take (or must take), and provide you with the best options for you. Know and follow the major curriculum. Make sure you review major degree checks and sample plans, plan that include general education (college) and major requirements, as well as your degree audit. If you don't understand the information or have questions, meet with your advisor (see #3 above)! Taking the courses on the plans in the order listed will help make sure you have met prerequisites needed to enroll. Get ready for the quarter. Complete all academic and business related tasks on time. Know your enrollment time well in advance and be prepared. Apply to financial aid before the deadline. Check your grades. No one can do this for you! Check your degree audit often...at least once per quarter. It provides a checklist of all the course requirements you have completed, and those you still need to finish to earn your degree. If you get off track, or are interested in study abroad or research, which may take you off track, meet with your advisor. Advisors can help you navigate these opportunities and show you how they can fit into your degree requirements. Consider taking courses during summer session. Courses offered during summer can fulfill major degree requirements. Take advantage of smaller classes, but remember, summer session is only five-weeks long, so the pace is fast. Talk to your advisor about what courses to take and how they fit into your requirements to graduate. Once you near your last quarters at UC San Diego, be sure to meet with your major and college advisors for a thorough check of your academic record. They will help to ensure you are on track to complete all your graduation requirements on time.